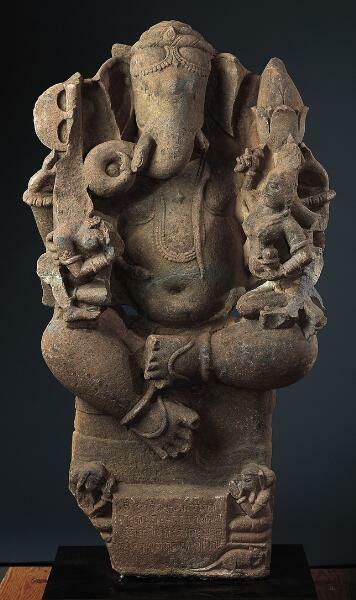 The rectangular panel underneath this sculpture of Ganesha bears an inscription that gives the name of its donor and the date at which it was installed, presumably at a temple (Vikram year 1221, or 1164 C.E.). Although the name of the donor is partially obscured, the inscription goes on to mention the name of his father, Vahadeva, as well as the caste to which their family belonged. The kneeling male figures on either side of the panel probably represent the donor and his father. The inscription also identifies the female figures seated on Ganesha’s knees as his wives Siddhi (success) and Buddhi (intelligence). Move over Babar, Horton and Dumbo. This elegant elephant is a god! His name is Ganesha, and he’s the Hindu Lord of Wisdom and Overcomer of Obstacles. That means he can remove anything that might get in the way when you’re starting a new project. People pray to him and rub his round belly for luck before they go on a trip, get married or take a test in school. Once upon a time the goddess Parvati created a boy out of the dirt of her body, and told him to guard the bathroom door while she bathed. When her husband Shiva returned, the boy would not let him in. So Shiva cut off the young man’s head in rage! Parvati was heartbroken. To soothe his grieving wife, Shiva attached the head of an elephant to the boy’s body and brought him back to life. Then he embraced Ganesha as his son. Now look closely in the lower right hand corner…see the rat? It may seem weird, but giant Ganesha rides around on that tiny rodent! In the Hindu religion every god has a special animal they use for transportation. Ganesha is the most popular and happiest of the Hindu gods. And why shouldn’t he be? He is worshipped before all others, eats his fill of sweets, and is married to two wives—here, there’s one on each knee. One is Siddhi, which means “prosperity." The other is Buddhi, which means “intelligence.” Ah, the life of an all-powerful pachyderm!